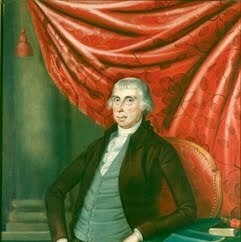 Death Anniversary - James Madison, Sr.
James Madison, Sr. was a prominent Virginia planter, who served as a colonel in the militia during the American Revolutionary War. He inherited Mount Pleasant, later known as Montpelier, a large tobacco plantation in Orange County, Virginia and, with the acquisition of more property, had 5,000 acres and became the largest landowner in the county. He was father to U.S. President James Madison, who inherited what he called Montpelier.